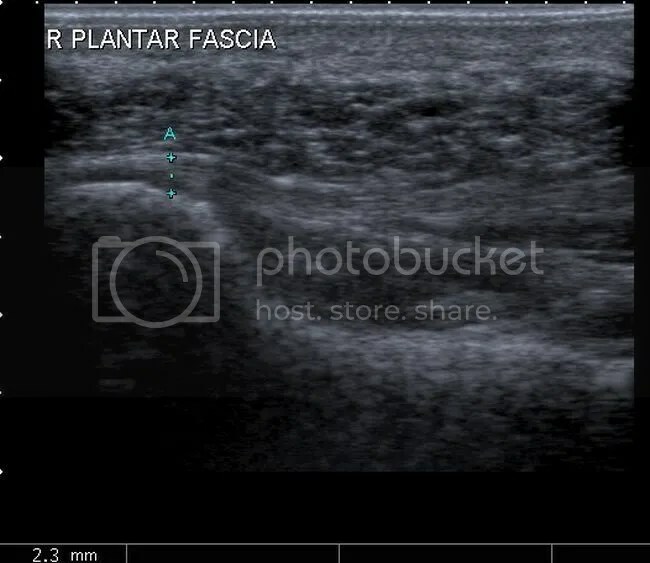 The plantar fascia is a thickened fibrous aponeurosis that originates from the medial tubercle of the calcaneus, runs forward to insert into the deep, short transverse ligaments of the metatarsal heads, dividing into 5 digital bands at the metatarsophalangeal joints and continuing forward to form the fibrous flexor sheathes on the plantar aspect of the toes. Small plantar nerves are invested in and around the plantar fascia, acting to register and mediate pain. Plantar Fasciitis is simply caused by overstretching of the plantar fascia ligament under the foot. So why is the ligament being overstretched? There are different factors, over-use, too much sports, running, walking or standing for long periods (e.g. because of your job) weight gain, our feet are designed to carry a ‘normal’ weight. Any excess weight places great pressure on the bones, nerves, muscles and ligaments in the feet, which sooner or later will have consequences. Even pregnancy (in the last 10 weeks) can cause foot problems! age, as we get older ligaments become tighter & shorter and msucles become weaker; the ideal circumstances for foot problems, unsupportive footwear, ‘floppy’ shoes with no support as well as thongs affect our walking pattern, walking barefoot, especially on hard surfaces like concrete or tiles, low arch and flat feet or over-pronation. An important contributing factor to Plantar Fasciitis is ‘excess pronation’ (or over-pronation). This is a condition whereby the feet roll over, the arches collapse and the foot elongates. This unnatural elongation puts excess strain on the ligaments, muscles and nerves in the foot. When the foot is not properly aligned, the bones unlock and cause the foot to roll inward. With every step taken your foot pronates and elongates, stretching the plantar fascia and causing inflammation and pain at the attachment of the plantar fascia into the heel bone. Re-alignment of the foot should therefore an important part of the treament regime. The health care provider will perform a physical exam. This may show tenderness on the bottom of your foot, flat feet or high arches, mild foot swelling or redness, stiffness or tightness of the arch in the bottom of your foot. X-rays may be taken to rule out other problems. Making sure your ankle, Achilles tendon, and calf muscles are flexible can help prevent plantar fasciitis. Stretch your plantar fascia in the morning before you get out of bed. Doing activities in moderation can also help. Plantar fasciitis is a common foot disorder that affects more than two million people every year, especially runners. It is inflammation of the plantar fascia, a thick band of tissue on the bottom of the foot. The most common area of pain is directly on the bottom of the heel, although some people may only have pain in the arch of the foot. Diagnosis of plantar fasciitis is typically done through a physical examination, which includes listening to the patient history, palpation of the heel and possibly x-rays. Plantar fasciitis is a painful disorder in the lower part of your foot usually around the heel. That pain usually hurts as you get up in the morning when you try to stand on your feet, or after any periods of inactivity. It is a disorder of a tough and strong band that connects the heel bone to the toes. Plantar Fasciitis is caused by injuring that tough band on the bottom of the foot. The following may be the causes of plantar fasciitis. Tight calf muscles or tight Achilles tendon produces repetitive over-stretching of the plantar fascia. Gait and balance Problem may be a dominant cause of this disorder. Many people have a special style of walking, with something unique that causes some kind of imbalance in their body. It might be something like locked knees, feet that turn-out, a weak abdomen etc. This imbalance may place some pressure on the fascia, which eventually causes plantar fasciitis. Weak foot muscles don’t give enough support to the plantar fascia. The small muscles in the foot give the foot its shape by keeping the bones in place and by expanding and contracting to make a movement. Weak foot muscles will allow greater stress on the fascia. Foot anatomical problems such as flat feet or high arches can make the fascia ligament work or stretch abnormally. Flattening of the fat pad at the sole of the feet under the heels is a Degeneration process that is caused by poor footwear or by age. Shoes that have no proper heel cup can flatten that fat pad quite quickly and cause this disorder. Walking in shoes which do not have good arch support is considered to be a cause of plantar fasciitis. Wearing inadequate or worn out shoes may place more stress on the fascia ligament. If you wear shoes that don’t fit you by size or width, you may put your feet under excessive stress. Overweight Men and women are more vulnerable to developing the condition because of the excess weight on the foot. Pregnant women are at risk due to gaining weight through pregnancy and due to the pregnancy hormones that make ligaments loosen and relax. Sudden increase of activity like starting to run long distance or complete change of daily activity can cause heel pain and this disorder. Practice of repetitive athletic activities, like long distance running, playing a ball game, dancing or jumping, is a common cause for the disorder. Actually it is considered as one of the most common running injuries. Spending long periods of time on your feet everyday can cause plantar fasciitis. Working on your feet a few hours a day evey day may be the reason for your heel pain. Plantar fasciitis is usually found in one foot. While bilateral plantar fasciitis is not unheard of, this condition is more the result of a systemic arthritic condition that is extremely rare in an athletic population. There is a greater incidence of plantar fasciitis in males than females (Ambrosius 1992). While no direct cause could be found it could be argued that males are generally heavier which, when combined with the greater speeds, increased ground contact forces, and less flexibility, may explain the greater injury predisposition. The most notable characteristic of plantar fasciitis is pain upon rising, particularly the first step out of bed. This morning pain can be located with pinpoint accuracy at the bony landmark on the anterior medial tubercle of the calcaneus. The pain may be severe enough to prevent the athlete from walking barefooted in a normal heel-toe gait. Other less common presentations include referred pain to the subtalar joint, the forefoot, the arch of the foot or the achilles tendon (Brantingham 1992). After several minutes of walking the pain usually subsides only to re turn with the vigorous activity of the day’s training session. The problem should be obvious to the coach as the athlete will exhibit altered gait and/ or an abnormal stride pattern, and may complain of foot pain during running/jumping activities. Consistent with plantar fascia problems the athlete will have a shortened gastroc complex. This can be evidenced by poor dorsiflexion (lifting the forefoot off the ground) or inability to perform the “flying frog” position. In the flying frog the athlete goes into a full squat position and maintains balance and full ground contact with the sole of the foot. Elevation of the heel signifies a tight gastroc complex. This test can be done with the training shoes on. Treatment for heel pain usually involves using a combination of techniques, such as stretches and painkillers, to relieve pain and speed up recovery. Most cases of heel pain get better within 12 months. Surgery may be recommended as a last resort if your symptoms don’t improve after this time. Only 1 in 20 people with heel pain will need surgery. Whenever possible, rest the affected foot by not walking long distances and standing for long periods. However, you should regularly stretch your feet and calves using exercises such as those described below. Pain relief. Non-steroidal anti-inflammatory drugs (NSAIDs), such as ibuprofen, can be used to help relieve pain. Some people also find applying an ice pack to the affected heel for 5-10 minutes can help relieve pain and inflammation. However, do not apply an ice pack directly to your skin. Instead, wrap it in a towel. If you do not have an ice pack, you can use a packet of frozen vegetables. An important part of prevention is to perform a gait analysis to determine any biomechanical problems with the foot which may be causing the injury. This can be corrected with orthotic inserts into the shoes. If symptoms do not resolve then surgery is an option, however this is more common for patients with a rigid high arch where the plantar fascia has shortened. Plantar fasciitis is one of those injuries that magically seems to appear for no apparent reason. However, plantar fasciitis is caused by one of two methods. They are either traction or compression injuries. Plantar fasciitis is most often associated with impact and running sports, especially those that involve toe running rather than heel running styles. It is also commonly diagnosed in individuals with poor foot biomechanics that stress the plantar fascia. Flat feet or weak foot arch control muscles are two common causes of plantar fasciitis. The pain is more intense with your first steps out of bed in the morning or after sitting for a while. The reason for this is that during rest our muscles and ligaments tend to shorten and tighten up. The tightening of the plantar fascia means more traction on the ligament making the tissue even more sensitive. With sudden weight-bearing the tissue is being traumatised, resulting in a stabbing pain. After walking around for a while the ligament warms up, becomes a little bit more flexible and adapts itself, making the pain go way entirely or becoming more of a dull ache. However, after walking a long distance or standing for hours the pain will come back again. To prevent the sudden sharp pain in the morning or after sitting, it is important to give the feet a little warm-up first with some simple exercises. Also, any barefoot walking should be avoided, especially first thing in the morning, as this will damage to the plantar fascia tissue. Aparty from pain in the heel or symptoms may include a mild swelling under the heel. In addition, heel pain is often associated with tightness in the calf muscles. Tight calf muscles are a major contributing factor to Plantar Fasciitis. After you describe your symptoms and discuss your concerns, your doctor will examine your foot. Your doctor will look for these signs. A high arch, an area of maximum tenderness on the bottom of your foot, just in front of your heel bone. Pain that gets worse when you flex your foot and the doctor pushes on the plantar fascia. The pain improves when you point your toes down. Limited “up” motion of your ankle. Your doctor may order imaging tests to help make sure your heel pain is caused by plantar fasciitis and not another problem. X-rays provide clear images of bones. They are useful in ruling out other causes of heel pain, such as fractures or arthritis. Heel spurs can be seen on an x-ray. Other imaging tests, such as magnetic resonance imaging (MRI) and ultrasound, are not routinely used to diagnose plantar fasciitis. They are rarely ordered. An MRI scan may be used if the heel pain is not relieved by initial treatment methods. Teatment of plantar fasciitis can be a long and frustrating process for both the coach and athlete. If you do not have a firm grasp of the goals of this rehabilitation program your best advice will be to find a professional who routinely deals with athletic injuries. The “down time” for plantar fasciitis will be at least six weeks and up to six months of conservative care before drastic measures like surgery should be considered. The goal of this rehab program is to initially increase the passive flexion of the foot eventually leading to improvements in dynamic balance and flexibility of the foot and ankle, followed by a full return to function.